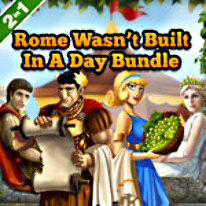 Relive the glory of Ancient Rome in this thrilling time management bundle! In When in Rome, you must help sad, lonely Flavius, who has been tasked by the Emperor with expanding Rome's lands. Build roads, new settlements and towns. When in Rome, do as Flavius does! Also included is Roads of Rome 2, in which you must help Victorius overcome all challenges in his quest to the kingdom of the Gods where he will ask for an antidote to the powerful poison that has been given to Caesar!